Este artículo analiza las diferencias en el nivel de supervivencia entre el emprendimiento social y el emprendimiento de negocios, así como el efecto de la formación, experiencia y motivación para emprender sobre la supervivencia. Dada la naturaleza de las variables dependientes, se optó por utilizar la prueba de Pearson, la prueba de Mann-Whitney para dos muestras independientes y el modelo logit sobre una muestra de 2.175 empresas. Los resultados no muestran diferencias significativas en la probabilidad de sobrevivir entre los dos tipos de emprendimiento, pero sí parecen mostrar la existencia de diferencias significativas en la influencia de las variables independientes analizadas sobre la supervivencia. Agarwal, R. & Audretsch. D. B. (2001). Does entry size matter? The impact of the life cycle and technology of firm survival. The Journal of Industrial Economics, 49(1), 21-43. Agarwal, R., Echambadi, R., Franco, A. & Sarkar, M. (2004). Knowledge transfer through inheritance: Spin-out generation, development, and performance. Academy of Management Journal, 47(4) 501–522. Alvord, S. Brown, D. & Letts, C. (2002). Social entrepreneurship and social transformation: an exploratory study. Hauser Center for Nonprofit Organizations, 15, 1-26. Arthur, S., Keenoy, T., Scott-Cato, M. & Smith, R. (2006). Where is the social in social enterprise? En D. Fuller, A.E.G. Jonas & R. Lee (Eds. ), Alternative spaces of economy, society and politics: interrogating alterity (pp. 207-222). Aldershot, UK: Ashgate. Austin, J., Stevenson, H. & Wei-Skillern, J. (2006). Social and Commercial Entrepreneurship: Same, Different, or Both?. Entrepreneurship Theory and Practice, 30(1), 1-22. Barney, J.B. (1997). Gaining and sustaining competitive advantages. New York, NY: Addison-Wesley. Bolton, W. & Thompson, J. (2000). Entrepreneurs: Talent, Temperament, Technique. Oxford, UK: Butterworth Heinemann. Bornstein, D. & Davis, S. (2010). Social Entrepreneurship. What everyone needs to know. Oxford, UK: Oxford University Press. Boschee, J. (1995). Some nonprofits are not only thinking about the unthinkable, they're doing it–running a profit. Across the Board, the Conference Board Magazine, 32(3), 20–25. Bosma, N. & Levie, J. (2009). 2009 Global Report del Global Entrepreneurship Monitor. Recuperado el 15 de junio de 2011, de http://www.gemconsortium.org/docs/download/265. Bosma, N., Van Praag, M. & de Wit, G. (2000). Determinants of Successful Entrepreneurship. Research Report 0002/E, Scientific Analysis of Entrepreneurship and SMEs. Netherlands: EIM Business & Policy Research. Brock, D.D. (2008). Social Entrepreneurship Teaching Resources Handbook. 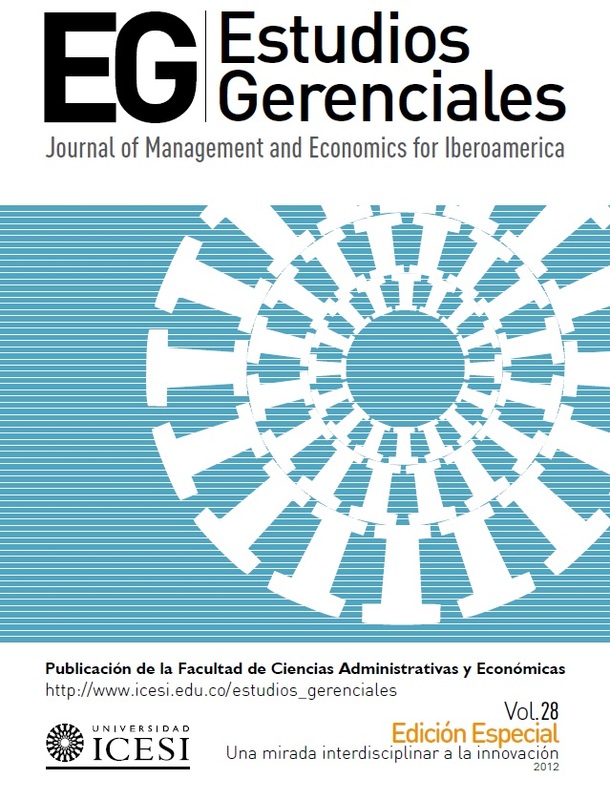 Disponible en http://dx.doi.org/10.2139/ssrn.1344412. Brüderl, J. & Schussler, R. (1990). Organizational mortality: the liabilities of newness and adolescence. Administrative Science Quarterly, 35(3), 530-547. Brüderl, J., Preisendörfer, P. & Ziegler, R. (1992). Survival chances of newly founded business organizations. American Sociological Review, 57(2), 227–242. Caneda, A. & García, O. (2008, septiembre). Factores clave para el ''éxito infantil'' de las nuevas empresas. Documento no publicado presentado como ponencia en XVIII Congreso Nacional de ACEDE, León, España. Castrogiovanni, G.J. (1996). Pre-startup planning and the survival of new small businesses: Theoretical linkages. Journal of Management, 22(6), 801–822. Catford, J. (1998). Social entrepreneurs are vital for health promotion – but they need supportive environments too. Health Promotion international, 13(2), 95-97. Churchill, N.C. & Lewis, V.L. (1983). The five stages of small business growth. Harvard business review, 61(3), 30-50.
Cooper, A.C., Gimeno-Gaston, F.J. & Woo, C.Y. (1994). Initial human and financial capital as predictors of new venture performance. Journal of Business Venturing, 9(5), 371–395. Dees, J. (1998). The meaning of ''social entrepreneurship''. Recuperado el 10 de junio de 2011, de http://www.caseatduke.org/. Dencker, J.C., Gruber, M. & Shah, S.K. (2009). Pre-entry knowledge, learning, and the survival of new firms. Organization Science, 20(3), 516-537. Diario Oficial de la Comunidad Valenciana –DOCV. (2007). Orden de 19 de diciembre, por la que se convoca concurso público para la concesión de ayudas para el equipamiento de empresas creadas por jóvenes. Recuperado el 10 de junio de 2011, de http://www.docv.gva.es/datos/2007/01/23/pdf/2006_15363.pdf. Dorado, S. (2006). Social Entrepreneurial Ventures: Different Values so Different Process, no?. Journal of Development Entrepreneurship, 11(4), 319-343. Doyle, P. & Ho, M. (2010). How opportunities develop in Social Entrepreneurship. Entrepreneurship Theory & Practice, 34(4), 635-659. Drayton, W. (2002). The Citizen Sector: Becoming as Entrepreneurial and Competitive as Business. California Management Review, 44(3), 120-133. Dunne, P. & Hughes, A. (1994). Age, size, growth and survival: UK companies in the 1980s. The Journal of Industrial Economics, 42(2), 115-140. Evans, D.S. & Leighton, L.S. (1989). Some empirical aspects of entrepreneurship. The American Economic Review, 79(3), 519–535. Fogel, K., Lee, K. & McCumber, W. (2011). Handbook of Research on Innovation & Entrepreneurship (pp. 119-133). Northampton, MA: Edward Elgar. Fritsch, M., Brixy, U. & Falck, O. (2006). The effect of industry, region and time on new business survival – A multidimensional analysis. Review of Industrial Organization, 28(3), 285-306. Gimeno, J., Folta, T., Cooper, A. & Woo, C. (1997). Survival of the fittest? Entrepreneurial human capital and the persistence of underperforming firms. Administrative Science Quarterly, 42(4), 750–783. Guzmán, A. & Trujillo, M.A. (2008). Emprendimiento Social – Revisión de literatura. Estudios Gerenciales, 24(109), 105-125. Disponible en http://www.icesi.edu.co/revistas/index.php/estudios_gerenciales/article/view/321/1139. Haber, S. & Reichel, A. (2005). Identifying performance measures of small ventures – the case of the tourism industry. Journal of Small Business Management, 43(3), 257-286. Harding, R. (2004). Social Enterprise: The New Economic Engine. Business Strategy Review, 15(4), 39-43. Harris, J., Sapienza, H. & Bowie, N. (2009). Ethics and entrepreneurship. Journal of Business Venturing, 24(5), 407–418. Haugh, H. (2007). Community-Led Social Venture Creation. Entrepreneurship theory and practice, 31(2), 161-182. Hayward, M.L.A., Shepherd, D.A. & Griffin, D. (2006). A Hubris Theory of Entrepreneurship. Management Science, 52(2), 160-172. Headd, B. (2003). Redefining Business Success: Distinguishing Between Closure and Failure. Small Business Economics, 21(1), 51-61. Ho, Y. & Wong, P. (2007). Financing, regulatory costs and entrepreneurial propensity. Small Business Economics, 28(2-3), 187-204. Honig, B. (1998). What determines success? Examining the human, financial, and social capital of Jamaican microentrepreneurs. Journal of Business Venturing, 13(5), 371–394. Klepper, S. (2002). The capabilities of new firms and the evolution of the US automobile industry. Industrial Corporate Change, 11(4), 645–666. Klepper, S. & Simons, K. (2000). Dominance by birthright: Entry of prior radio producers and competitive ramifications in the U.S. television receiver industry. Strategic Management Journal, 21(1), 997–1016. Knaup, A.E. (2005). Survival and Longevity in the business employment dynamics database. Monthly Labor Review, 128(5), 50-56. Kolstad, I. (2007). Why Firms Should Not Always Maximize Profits. Journal of Business Ethics, 76(2), 137-145. Korunka, C., Kessler, A., Frank, H. & Lueger, M. (2010). Personal characteristics, resources, and environment as predictors of business survival. Journal of Occupational and Organizational Psychology, 83(4), 1025-1051. Leadbeater, C. (1997). The Rise of the Social Entrepreneur. Londres: Demos. Letowski, A. (2004). Le devenir des entrepreneurs créateurs ayant cessé l'exploitation de leur entreprise. París: DECAS (Direction des Entreprises Commerciales, Artisanales et des Services). Ligane, A. & Olsen, S. (2004). Guidelines for Social Return on Investment. California Management Review, 46(3), 116-135. Light, C.L. (2006). Reshaping social entrepreneurship. Stanford Social Innovation Review, 4(3), 45-51. Lohman, R. (1989). A lettuce is non-animal: Towards a positive economics of voluntary action. Nonprofit & Voluntary Sector Quarterly, 18(4), 367-383. Lohman, R. (1992). The Commons: A multidisciplinary approach to nonprofit organization, voluntary action and philanthropy. Nonprofit & Voluntary Sector Quarterly, 21(3), 309-323. Mair, J. & Martí, I. (2006). Social entrepreneurship research: A source of explanation, prediction, and delight. Journal of World Business, 41(1), 36-44. Massetti, B.L. (2008). The Social Entrepreneurship Matrix as a ''Tipping Point'' for Economic Change. E:CO, 3(10), 1-8. Mitchell, W. (1989). Whether and when? Probability and timing of incumbents' entry into emerging industrial subfields. Administrative Science Quarterly, 34(2), 208–230. Mizic, N. & Jacobson, R. (2003). Trading off between value creation and value appropriation: The financial implications of shifts in strategic emphasis. Journal of Marketing, 67(1), 63-76. Mort, G.S., Weerawardena, J. & Carnegie, K. (2003). Social entrepreneurship: Towards conceptualization. International Journal of Non-profit and Voluntary Sector Marketing, 8(1), 76-88. Mount, J., Zinger, J.T. & Forsyth, G. (1993). Organizing for Development in the Small Business. Long Range Planning, 26(5), 111-120. Nicholls, A. (2010). The legitimacy of Social Entrepreneurship. Reflexive isomorphism in a pre-paradigmatic field. Entrepreneurship Theory & Practice, 34(4), 611-633. Peredo, A.M. & McLean, M. (2006). Social Entrepreneurship: A Critical Review of the Concept. Journal of World Business, 41(1), 56-65. Phillips, B.D. & Kirchhoff, B.A. (1989). Formation, Growth and Survival: Small Firm Dynamics in the U.S. Economy. Small Business Economics, 1(1), 65-74. Reis, T. (1999). Unleashing the new resources and entrepreneurship for the common good: A scan, synthesis and scenario for action. Recuperado el 20 de junio de 2011, de http://onlinelibrary.wiley.com/doi/10.1002/pf.3206/abstract. Reis, T. & Clohesy, S. (2001). Unleashing new resources and entrepreneurship for the common good: A philanthropic renaissance. New Directions for Philanthropic Fundraising, 32, 109-144. Reuber, A.R. & Fischer, E. (1999). Understanding the consequences of founders' experience. Journal of Small Business Management, 37(2), 30–45. Reynolds, P.D., Camp, S.M., Bygrave, W.D., Autio, E. & Hay, M. (2001). Global Entrepreneurship Monitor 2001 Summary Report. Kansas City, KS: Kauffman Center for Entrepreneurial Leadership at the Ewing Marion Kauffman Foundation. Disponible en http://www.gemconsortium.org/docs/download/255. Ribeiro, D. & Castrogiovanni, G. (2012). The impact of education, experience and inner circle advisors on SME performance: insights from a study of public development centers. Small Business Economics, 38(3), 333-349. Roberts, D. & Woods. C. (2005). Changing the world on a shoestring: The concept of social entrepreneurship. University of Auckland Business Review, 7(1), 45-51. Santos, F. (2009). A positive theory of Social Entrepreneurship. INSEAD: The Business School for the world, 23, 1-54. Sapienza, H.J. & Grimm, C. (1997). Founder characteristics, start-up process, and strategy/structure variables as predictors of shoreline railroad performance. Entrepreneurship: Theory & Practice, 22(1), 5-24. Schiller, B.R. & Crewson, P.E. (1997). Entrepreneurial Origins: A Longitudinal Inquiry. Economic Inquiry, 35(July), 523-531. Schumpeter, J.A. (1942). Capitalism, socialism and democracy. New York, NY: Harper and Row. Shane, S. & Venkataraman, S. (2000). The promise of entrepreneurship as a field of research. Academy of Management Review, 25(1), 217-226. Sheperd, D. (1999). Venture Capitalists' Assessment of New Venture Survival. Management Science, 45(5), 621-632. Short, J.C., Moss, T.W. & Lumpkin, G.T. (2009). Research in Social Entrepreneurship: Past Contributions and Future Opportunities. Strategic Entrepreneurship Journal, 3(2), 161-194. Simms, M. (2009). Insights from a Management Prophet: Mary Parker Follett on Social Entrepreneurship. Business & Society Review, 3(114), 249-363. Social Enterprise Knowledge Network – SEKN. (2006). Gestión efectiva de emprendimientos sociales: Lecciones extraídas de empresas y organizaciones de la sociedad civil en Iberoamérica. Washington, DC: Inter-American Development Bank. Stinchcombe, A.L. (1965). Social Structure and Organizations. En J.G. March (Ed. ), Handbook of Organizations (pp. 142–193). Chicago, IL: Rand McNally. Sullivan, D.M. (2007). Stimulating Social Entrepreneurship: Can Support From Cities Make a Difference?. Perspectives - Academy of Management, 21(1), 77-78. Thompson, J.L. (2002). The world of the social entrepreneur. The International Journal of Public Sector Management, 15(5), 412-431. Thompson, J.L., Alvy, G. & Lees, A. (2000). Social entrepreneurship – a new look at the people and the potential. Management decision, 38(5), 328-338. Van de Ven, A., Hudson, R. & Schroeder, D. (1984). Designing new business startups. Entrepreneurial, organizational, and ecological considerations. Journal of Management, 10(1), 87-107. Van Praag, C.M. (2003). Business survival and success of young small business owners. Small Business Economics, 21(1), 1–17. Van Slyke, D.M. & Newman, H.K. (2006). Venture Philanthropy and Social Entrepreneurship in Community Redevelopment. Case Study in Non Profit Management and Leadership, 16(3), 345-368. Verheul, I. & Thurik, R. (2000). Start-up capital: differences between male and female entrepreneurs, does gender matter? ERIM Report Series Research in Management ERS-2000-07-STR. Disponible en http://ideas.repec.org/p/fth/miklrr/9910-e.html. Weitzman, M. & Jalandoni, N. (2002). The New Nonprofit Almanac and Desk Reference. San Francisco, CA: Jossey Bass. West, G. & Noel, T. (2009). The impact of knowledge resources on new venture performance. Journal of Small Business Management, 47(1), 1–22. Zadek, S. & Thake, S. (1997) Send in the social entrepreneurs. New Statesman, 126(4339), 31–34. Zahra, S.A., Gedajlovic, E., Neubaum, D.O. & Shulman, J.M. (2009). A typology of social entrepreneurs: Motives, search processes and ethical challenges. Journal of Business Venturing, 24(5), 519-532.